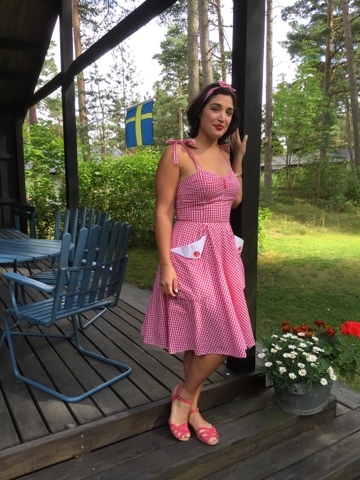 Sweltering summer heat has made its way to Sweden, and I couldn't be happier! Cool, airy clothes are the order of the day, and I'm a Hawaii girl, so I've got lots of those. Since I'm out in the country, what's better for a hot summer day than some cotton gingham? 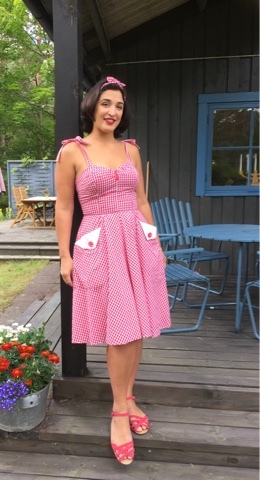 Trashy Diva has a super cute line of vintage-inspired gingham dresses and tops. I got not one but two dresses from this collection and one of them is this Lucy dress. People have literally stopped and asked me where I got this dress from. Luckily for them, this is a reproduction, not one of my nearly one of a kind vintage dresses, so they can get one of these lovelies too!